Late last month, the Asia Pacific hosted two very important and starkly contrasting international conferences on the region’s energy and climate choices. A very high level, invitation-only summit in Singapore declared that the region’s energy options are limited to choosing from a mix of coal, gas and nuclear, with renewable energy’s role merely marginal. But a far more diverse and innovative conference in Honolulu, one that included the US military, demonstrated that renewable energy is the region’s economically and environmentally rational choice. As we shall see, there was one key difference between these polarized positions on what is perhaps the single most important issue of our era. The Singapore event focused on the supply side of energy whereas the Hawaii summit examined the energy system in its entirety. The Hawaii event paid particular attention to the increasingly crucial role of microgrids and other enabling infrastructures that reshape the demand side as well as the supply side. This short article reviews both events and asks why the Singapore summit ignored the role of smart networks. We then conclude by showing how smart infrastructures are becoming central to climate-change mitigation and adaptation. But let us begin by at least loosely defining microgrids, as this article refers repeatedly to them and they are hardly a familiar technology. As depicted in the attached figure, “A Typical Microgrid,” the microgrid is a local network infrastructure that usually “functions somewhat like the large electric grid, but serves a much smaller footprint. It provides energy for one or more customers within a contained boundary, and it typically operates multiple sources of power generation and possibly heating and cooling, and includes the wires and pipes to deliver the energy. It also may include energy storage and electric vehicles.”1 Equipped with smart monitoring and controls, microgrids can dramatically change both the supply and demand sides. Microgrids can help communities maximize their use of renewable energy as well as minimize their consumption of energy overall. Previous NBR energy summits have been held in Beijing (2015), Seoul (2014), Vancouver (2013), Hanoi (2012), Jakarta (2011), and Tokyo (2009), with no event having been held in 2010. All the earlier summits have been followed up with very professional and detailed summary reports and related information, including audio files.5 However, as of this writing no summary report and audio files are available for the Singapore meeting. In consequence, we have to assess the 2016 event’s overall tone on energy options and sustainability from the information currently made available. Fortunately, prior to the conference, the NBR uploaded several working papers for presentation, along with a number of “summit briefs.” These documents remain available at the conference website, and provide a window into the conference as well as much food for thought. Notably, none of them portrays renewable energy as a significant option for the region’s electricity and primary-energy portfolios. And that downplaying of renewables is generally the case with documents from the previous NBR energy summits. Thurber’s arguments are well-grounded in dismaying empirical fact, especially the enormity of our current energy consumption and the dominance of fossil fuels in supplying it. He begins by outlining the conspicuous role of carbon-intensive coal, both globally and in Asia’s energy portfolio. Drawing on International Energy Agency (IEA) statistics, from its 2015 World Energy Outlook, Thurber notes that in 2013 coal provided 29 percent of global primary energy demand and 41 percent of electric power generation, the latter share exceeding any other energy source. Thurber adds that in spite of crippling environmental costs, coal remains attractive to emerging economies because it is cheap, requires only modest infrastructure deployments, is plentiful and widely distributed, and provides reliable 24/7 “baseload” power generation. Indeed, Thurber cites IEA predictions that coal use appears likely to increase by 11 percent between 2013 and 2040. The data also show that Asia was responsible for 71 percent of global coal consumption, far greater than the region’s 54 percent share of global population and 38 percent share of global GDP. The IEA further suggests that by 2040, Asia’s share of global coal consumption could reach roughly 80 percent. Thurber warns that the projected increase in coal consumption, if it comes to pass, will put any reasonable climate goals in serious jeopardy. He then turns to the coal industry and environmental NGOs’ plans for avoiding climate catastrophe. As Thurber portrays it, the coal industry argues that carbon capture and storage (CCS) technology can restrict the release of carbon dioxide, whereas the environmental NGOs insist that coal’s role can be replaced by wind and solar. Thurber then takes up the question of whether renewables can displace coal, concluding that the answer is no. He contends that renewables are more costly than coal and not yet ready to scale up and provide the prodigious amounts of energy needed to substitute for coal. He also believes renewables are incapable of acting as a baseload power source due to their intermittency, since solar and wind facilities often do not generate power or do so unsteadily. Thurber goes on to examine the mix of institutions and policies that have shaped individual countries’ energy profiles, and what might be done to shift them towards greater reliance on lower-carbon gas and nuclear alternatives. His paper is fascinating and informative, and deserves a wide reading. Thurber’s position on renewables, which evidently framed the NBR event, is worth quoting at length. He declares that “[o]ver at least the next twenty years, the carbon emissions of the energy sector—and especially the energy sector in Asia—will on the supply side be shaped most importantly by the competition between coal, natural gas, and nuclear energy. This basic fact is inconvenient and therefore often goes unacknowledged. Environmental groups tend to breezily assert thatreplacing coal with renewables is straightforward and cost-effective.The general public wouldalso prefer to believe that renewables can solve all our problems such that difficult choices arenot necessary. Governments in countries with strong antinuclear movements, like Germany and Japan, do not draw attention to the fact that nuclear phase-outs go hand in hand with growth in the share of fossil fuels.” (pp. 3-4). But for our purposes here, Thurber’s most important claim is that there are serious weaknesses in the environmental NGOs’ outline of a renewable alternative. Certainly it is true that many environmental NGOs do not offer persuasive roadmaps for restructuring the power economy, especially at a speed commensurate with their insistence that fossil fuels and nuclear be abandoned promptly. The NGOs’ audience is often well-meaning citizen groups who, as Thurber suggests, just want to see more solar panels and wind farms. Hence, far too many NGO reports and conference presentations merely recite optimistic scenarios based on targets that are deemed technically possible, given average levels of insolation, wind-speed, and the like. The bulk of these energy visions omit serious discussion of the massive lifestyle and governance changes, infrastructural investments, and other unparalleled heavy-lifting required to achieve a quick shift to renewable energy as the basis of electricity generation, transport, industrial processes, and the myriad other aspects of the energy economy. So to some extent, Thurber’s criticism is on the mark. In fact, the problem of hortatory rather than critical thinking on energy is so acute that, also in June, highly regarded energy experts Richard Heinberg and David Fridley released their very readable Our Renewable Future: Laying the Path for One Hundred Percent Clean Energy. They also made the book freely available (though the present author ponied up for a Kindle copy, and so should you).11 As the book’s title makes clear, Heinberg and Fridley favour renewable energy, but they are hardly cheer-leaders. Rather, their work is a rigorous analysis of the various components – including power, transport, food - of the overall energy system, and the daunting challenges involved in supplanting the deeply entrenched role of fossil fuels. But Thurber and the NBR’s pessimism about the potential for renewable energy was not shared by the VERGE Asia Pacific Clean Energy Summit in Honolulu, held from June 21 to 23. And like Heinberg and Fridley, the VERGE event embraced the technical and other challenges that Thurber tells us are overlooked by environmental NGOs. For the Honolulu summit, GreenBiz partnered with the Hawaii State Energy Office. This cooperation made perfect sense, because as of June 8, 2015, Hawaii is committed to achieving 100% renewable power generation by 2045.14 VERGE Hawaii was thus in large measure devoted to exploring “the innovative policies, models, technologies and infrastructure needed to deliver on the state’s mandate of reaching 100% clean energy by 2045.” The VERGE event’s ambit of concern was clearly far more comprehensive than the Singapore summit’s focus on the supply-side of energy. Like all previous VERGE events, there are no uploaded powerpoints or working papers from VERGE Hawaii. Rather, the proceedings can be accessed via a video archive.21 The video record is not exactly gripping television, the kind you want to binge on, but the participants made a laudable effort to keep their presentations and discussion panels brief and to the point. Moreover, there were over 40 speakers, including Governor Ige and several mayors, numerous speakers from the US military (including the aforementioned Dennis McGinn), and a host of representatives from GreenBiz, the Rocky Mountain Institute, Blue Planet Foundation, and other government, business, and civil society organizations. In short, the event featured the kind of diversity we need in order to make energy transition a broad-based, societal project rather than the province of partisan politics or simplistic sloganeering. Given its objective of helping Hawaii achieve its goals, coupled with the diversity of the participants, the summit program was also very comprehensive. As shown in the attached figure, VERGE Hawaii covered infrastructure, technology, governance, and other important areas. Its presentations also took up the role of resilience, the water-energy-food nexus as well as what Hawaii’s project means for Japan, the Asia Pacific region, and the rest of the world. As noted, Hawaii’s renewable strategy does not include relying on natural gas as a “bridge to the future.” It also aims at going beyond the power sector and diffusing renewables further into transport and other aspects of the overall energy system. So it was no surprise to see that the event’s second presentation, following an overview of innovation in US power markets, was devoted to “How to Build a Microgrid.” Four experts with decades of experience in designing and assessing microgrids for military, university, and other applications provided a hands-on tutorial. Moreover, several of the other presentations explained the role of microgrids and related infrastructures in maximizing the penetration of all renewables as well as realizing deep gains in energy efficiency. In other words, the VERGE summit’s participants, their presentations, and the very tools they brought with them were a far cry from the magical thinking caricatured in Thurber’s working paper for the Singapore summit. As noted earlier, Thurber’s paper has much commendable content, including its emphasis on empirical reality as well as its criticism of simplistic expectations of renewable energy. Still, it is rather odd that an energy expert from Stanford would so readily dismiss the role of renewables in Asia. This is not only because Honolulu’s nearly simultaneous conference featured prominent, well-informed figures from government, the military, industry and other spheres showing that renewables are already competitive, that they bolster resilience, and that their role can be further enhanced through smart infrastructure. Another reason to be astonished is that Thurber’s place of employment, Stanford University, is itself an internationally recognized case study on how microgrids allow for very ambitious goals with renewable energy, including intermittent solar and wind. “A two-story administration building surrounds a small plaza, which has the hot-water thermal storage tank at its center. The tank, painted Stanford red and lit at night, evokes a beating heart at the center of a ‘system that pumps energy around the campus,’ says architect Joseph Collins, partner with ZGF Architects. In other words, it is very hard not to notice SESI because it is quite literally and deliberately “in your face” as physical infrastructure. And for energy experts, it is understood to be a key component of the institution’s impressive performance on sustainability. Were Stanford’s SESI project an inordinately costly and sui generis application, it would perhaps make sense to omit its lessons when examining the role of renewables in Asia. After all, many Asian countries are low-income, and one reason they use a lot of coal is that it is cheap. But as we have already seen, SESI is projected to save the university nearly a half-billion dollars. The SESI upfront installation costs are admittedly high, but its lifecycle costs were assessed as the lowest of any alternative.26 Clearly, nothing beats smart infrastructures whose renewable energy-input costs are on the way towards zero. Moreover, SESI’s environmental costs were the lowest of all other options. This is another important consideration for any country given the accumulating evidence of the massive the health costs from fossil fuels. Moreover, keeping to this paper’s definition of microgrids to include DHC systems, it turns out that there are even more in operation and that they already make an enormous contribution. For example, the United Nations Environment Programme (UNEP), the US Department of Energy, and other agencies started an initiative in 2013, concerning DHC. They studied 45 cities, including Tokyo, where all DHC is microgrid rather than city-wide, as in Copenhagen. The study found that DHC systems were key to many cities’ climate-resilience and carbon-reduction goals. They wrote up their results in a book-length publication District Energy in Cities: Unlocking the Potential of Energy Efficiency and Renewable Energy, which they released on February 25, 2015.29 Their survey determined that diffusion of advanced DHC would reduce spending and "combined with energy efficiency measures,could contribute as much as 58 per cent of the carbon dioxide (CO2) emission reductions required in theenergy sector by 2050 to keep global temperature rise to within 2–3 degrees Celsius” (p. 11). Moreover, they found that "Several countries withhigh shares of wind and solar power – such as China, Denmarkand Germany – have begun using district heat systems to utilizeexcess renewable electricity during periods of oversupply.” (p 12). In other words, the fluid running through the DHC system can be used like a large battery to store thermal energy and thus help balance the overall system. So the microgrid that is on display at Stanford is just one prominent example of the kind of enabling infrastructure that is rapidly going mainstream. The mainstreaming of microgrids was also one reason the VERGE Hawaii event used a microgrid to power its operations. Mainstreaming means mass production, and mass production leads to reduced unit costs. The past decade has seen the scale economies of mass production, coupled with accelerating technological advances, slash the prices of LED lighting, solar modules, wind turbines, smart sensors, and a host of other renewable and efficiency-related technologies. We can expect the same with smart heat and power networks. This conclusion involves neither rocket science nor arcane economic theory. The dynamism in the network infrastructure linking energy supply and demand should have figured in the arguments at Singapore, a city that is itself trying to innovate in microgrids. Let us hope that the Singapore conference – which was supported by the Asian Development Bank – had at least some sideline discussion on clean energy systems. The Stanford SESI model shows that high upfront installation costs lead to low medium to long-term running costs along with greatly reduced environmental and health impacts. That is the kind of investment we need in an era when, as a share of global energy investment, the Asia-Pacific region “is expected to account for over 40 per cent of the $68 trillion cumulative energy investments until 2040.”30 Smart microgrid networks not only help maximize efficiencies and the penetration of renewables; they also afford a promising focus for public and private investment at a time when all economies confront multiple systemic challenges in achieving environmental, fiscal, and socioeconomic sustainability. See p. 4 “Community Microgrids: A Guide for Mayors and City Leaders Seeking Clean, Reliable and Locally Controlled Energy,” June 2015. The NBR’s 2016 Pacific Energy Summit’s website is here. European oil firms were dismayed: “We thought that Exxon and Chevron might sign up to things like this, but then do very little about it,” says one executive at a major European oil company. “But they haven’t even done that,” in Ed Crooks and Kiran Stacey, “Big Oil: From black to green,” Financial Times, June 29, 2016. See Singapore Economic Development Board, “Clean Energy,” nd. The NBR Pacific Energy Summit reports are all available here. See Mark C. Thurber, “Coal, Gas, or Nuclear: Asia’s Inconvenient Energy Choice,” 2016 Pacific Energy Summit Working Paper. See Steckel, Jan Christoph, Ottmar Edenhofer and Michael Jacob, “Drivers for the renaissance of coal,” PNAS, Vol. 112, No. 29, July 21, 2015: pp 8799-9140. See “The promise of carbon capture and storage,” Exxon Mobil, nd. See p. 33 “BP Statistical Review of World Energy, June 2016”. On this, see (in Japanese) figure 214-1-8 on power generation in the 2016 Energy White Paper, p. 186. See Joel Makower, “Two Steps Forward: The Emergence of VERGE,” GreenBiz, April 18, 2011. On the goals, see “Governor Ige Signs Bill Setting 100 Percent Renewable Energy Goal in Power Sector,” Governor of the State of Hawaii, June 8, 2015. See the ulupono Initiative website. For the details, see NextEra Energy’s website. Opterra describes the range of services it provides on its website. In 2014, just under 70 percent of Hawaii’s power was generated by burning oil. On this, see “Hawaii: Profile Analysis,” US Energy Information Administration, September 17, 2015. 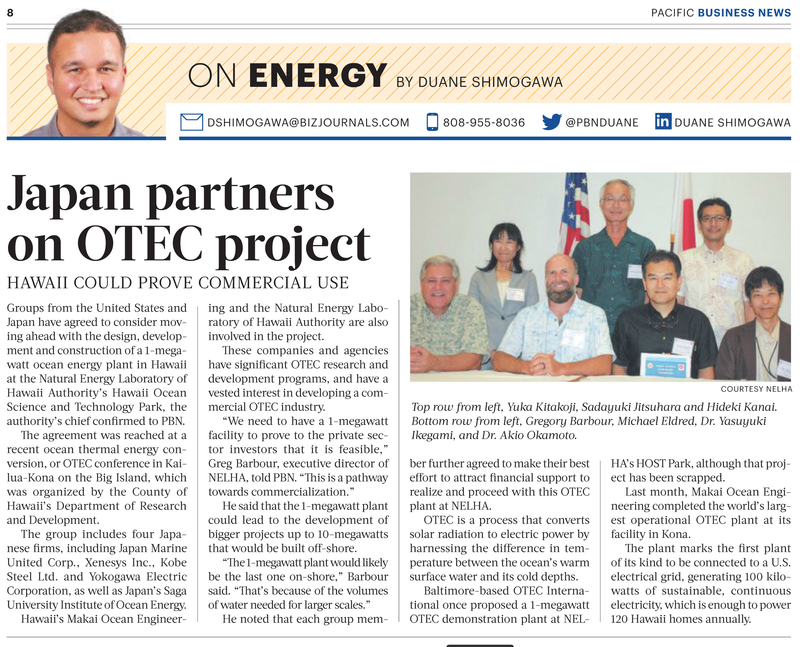 On the project, see Duane Shimogawa, “Japan partners on OTEC project,” Pacific Business News, September 18, 2015. On the Meetings, see “Governor signs historic agreement with Department of the Navy to advance clean energy opportunities,” Governor of the State of Hawaii, June 21, 2016. The archive can be accessed, after registration, at this site. See Wendy Koch, ““How to Avoid Storm Blackouts? Colleges Go Big With Microgrids,” National Geographic, March 18, 2016. On the system, see Karen Henry, “New Energy System Will Save Stanford $420M,” Energy Manager Today, April 20, 2015. See Lisa Lapin and Kate Chesley, “New Stanford energy system cuts greenhouse gas emissions 68 percent and fossil fuel 65 percent,” Stanford News, 2015. See Scott Blair, “Editors' Choice & Best Energy/Industrial: Stanford Energy System Innovations,” March 19, 2016. See “Frequently Asked Questions: Stanford Energy System Innovations (SESI) Program,” nd. “Distributed Generation: Cleaner, Cheaper, Stronger, Microgrids in the Evolving Power System,” Pew Research, February 26, 2016. See “International District Energy Association and Microgrid Resources Coalition announce merger to promote wider adoption of microgrids,” May 18, 2015. “District Energy in Cities: Unlocking the Potential of Energy Efficiency and Renewable Energy,” United Nations Environment Programme, May, 2015. See Towards a Sustainable Future: Energy Connectivity in Asia and the Pacific,” United Nations Economic and Social Commission for Asia and the Pacific, United Nations Economic and Social Commission for Asia and the Pacific, May 16, 2016.